This article is about the UNSC drop pod. For other articles on insertion vehicles, see drop pod. The Single Occupant Exoatmospheric Insertion Vehicle (SOEIV), informally known as the drop pod or egg, is a class of Human Entry Vehicle used by the United Nations Space Command to deploy an individual from high orbit to the surface. Manufactured by Ushuaia Armory, SOEIVs are deployed from orbiting naval vessels and are launched at a particular target, often behind enemy lines. Upon entering a world's atmosphere, a SOEIV employs brakes to slow itself down just short of impact. SOEIVs are often operated by the UNSC Marine Corps' Orbital Drop Shock Troopers, though some have seen use by the Corps' Hellbringers. A SOEIV bay of a Stalwart-class light frigate. The Single Occupant Exoatmospheric Insertion Vehicle is an angular pod which vary in size. Within the pod is a crash seat, communications gear, numerous equipment and weapon racks and lockers, and a rudimentary control system that allows for pod maneuvering. A "blunt carriage", a SOEIV has a single entry and escape hatch on one side. There is a braking chute system on the pod's top to slow it down and a reinforced impact plating on the bottom of it to absorb crash impact. The hardened and shielded communications systems within a SOEIV is built directly into the pod's hatch and enables its operator to synchronize deployment with others. In spite of the pod's apparent size, there is not much room for its occupant to move around, as most of the bulk is reserved for heat shielding, electronics, the safety harness, and equipment storage. A SOEIV is coated with ceramic plating, with an alloy crash cage underneath. To allow safe re-entry from high orbit or insertion from deep space, the top of the SOEIV possesses a rocket thruster that also serves as a maneuvering aid during the drop. The top of a SOEIV houses the pod's automated braking chute system, which itself is an extended cable attached to four petal-like flaps. The back of a SOEIV is entirely sealed off and the front often includes a variety of windows—though the latter feature is not present in every model of the pod. A gas-bolt–operated hatch system is incorporated into the pod's front half. The average SOEIV can vary dramatically in size from pod to pod. Typically, a SOEIV is 2.3 meters (7.5 feet) in length, 2.7 meters (8.9 feet) in width, and 5 meters (16 feet) tall. However, some SOEIVs are approximately 2.74 meters (9.0 feet) in length, 2.6 meters (8.5 feet) wide, and 5.5 meters (18 feet) in height, or taller. The average pod weighs 1,100 pounds (500 kilograms). A Single Occupant Exoatmospheric Insertion Vehicle is only capable of safely holding a single occupant. Each SOEIV contains a variable number of weapons, ammunition, rations, a radio, and can be used as a shelter if need be. Dedicated SOEIV variants exist to deliver supply caches to ground forces, ranging from weapons and ammunition, to small light vehicles such as an M274 ULATV Mongoose, and even a Shiva-class nuclear missile. These SOEIVs are slightly larger in size. The SOEIV also stores an extra tank of rocket fuel which is not used up in the landing but is rather used for moving to a different location if the vehicle has somehow been knocked off target or is in a currently undesirable location; however, the pod needs must be in the proper upright landing position in order for the booster to be usable. In use for nearly a century, SOEIVs allow for the rapid deployment of ground assault troops near or right onto an objective, a method known as "transorbital support interdiction". Their smaller profiles make them more difficult to destroy by defensive fire than conventional dropships. Despite the dangers related to SOEIV deployment, these drop pods have a lower overall casualty rate in combat than conventional dropship deployment. This is largely due to its occupants being conveyed separately, rather than together in one ship. SOEIVs can also be utilized by a spacecraft making a quick pass over a world, allowing for the deployment of hundreds of soldiers in quick succession. Drop pods have also seen use as ballistic projectiles, capable of destroying Blisterback artillery platforms. Each pod bears the name of the soldier inside; amongst other things this identification could be used to identify the unfortunate occupant of a destroyed pod. UNSC Insertion Protocols call for the commanding officer of an SOEIV-facilitated assault unit to land first to minimize the period of disorder that might occur as pods land and troopers deploy. The reasons for this rule include the strongly held belief that officers should lead rather than follow, should be willing to do anything their troops are asked to do, and should expose themselves to the same level of danger as their subordinates. The commander's pod is equipped with a great deal of equipment that the regular SOEIVs do not possess, including high-powered imaging gear, tactical sensors, and a fourth generation, Class-C military "dumb" artificial intelligence that serves to operate the aforementioned gear. SOEIV usage is popularly associated with the soldiers of the elite Orbital Drop Shock Trooper divisions, although UNSC Special Forces operators and SPARTAN-II supersoldiers are known to use these as one of their primary infiltration methods as well. SOEIVs being deployed to Installation 05. The drop pod's operator enters the Single Occupant Exoatmospheric Insertion Vehicle and straps in facing the hatch. The SOEIVs are located in a long, narrow compartment on a ship, colloquially referred to as "Hell's Waiting Room". The room is typically lined with two rows of drop pods. Each SOEIV is poised over a tube that extends downward through the spacecraft's belly. The preparation chambers are often stacked on multiple decks to allow several pods to be deployed via the same tube in rapid succession. To initiate deployment, a pod's operator must run an obligatory systems check, remove a series of safeties, and arm their ejection tube. Generally, the ship's fire control computer is responsible for ejecting the SOEIV at a trajectory that allowed it to drop into the correct entry path. The communications gear built into the SOEIV's hatch feeds the pod's occupant information relevant to the current operation and provides a link between all members of the unit during deployment, in addition to delivering a live video feed of other members of the unit to the pod's operator. A soldier's helmet-integrated communications units are redundant while within a SOEIV, and are normally only used if the pod's own communications gear malfunctions. Their integral helmet-comm gear will not function until the pod has cleared the interference of a world's upper atmosphere. A 30-second deployment countdown begins on the mark of the commanding officer of the unit. Afterwards, the SOEIVs fire quickly through the tube that runs down ship's belly. The drop pods are typically deployed from either a high altitude or from an exoatmospheric location. They are either fired out of the spacecraft or soft-ejected towards a world's surface until the pod breaches the atmosphere. The SOEIV is balanced to maintain flight stability in a feet-down position. The pod has limited maneuvering capability is primarily used to coordinate landings, but may be used to avoid defensive anti-aircraft fire. However, if defensive anti-aircraft weaponry is present near the deployment point, it is nearly a mathematical certainty that some pods will be lost. It is not uncommon for SOEIVs to be deployed in meteor and other debris showers on a world, as it provides a significant degree of stealth to a unit's deployment. SOEIVs carrying troopers from the 7th ODST Battalion entering Installation 05's upper atmosphere. The SOEIV's ceramic skin burns away during atmospheric re-entry, protecting the rest of the pod and its occupant from the worst of the considerable heat. An alloy crash cage is there to keep the armor from ripping away and to replace the ceramic skin once it burns away. If the ceramic skin that covers a SOEIV is damaged before or during the pod's entry into atmosphere, it has a tendency to fail spectacularly; this often results in the air inside the pod becomes unbelievably hot, sometimes fatally so. This is one of largest contributors for the SOEIV's relatively small size—the destruction of a single pod loss only results in one casualty rather than the deaths of the entire unit. As the pod's ceramic skin strips off, the interior of a SOEIV can reach temperatures as high as 37°C (98°F). At this point in the re-entry procedure, the pod is free-falling at terminal velocity. After the SOEIV has penetrated the atmosphere, at an altitude of 3,000 feet, the upper exterior panels separate acting as a drag-type chute, slowing its descent some and helping to keep the pod on course. At approximately 50 meters, the SOEIV's computer-controlled braking rockets engage. The pod is significantly slowed down as its momentum is reduced, allowing for a safe though somewhat abrupt landing. Braking rockets and drag chutes on SOEIVs do fail on rare occasions, resulting in the pod's occupant's death upon impact. This cause of death is feared by every Orbital Drop Shock Trooper, and is referred to in hushed tones as "digging your own grave." For this reason, the pods are equipped with at least one backup drag chute that automatically deploys in case of primary failure. SOEIVs are capable of smashing through almost any surface during re-entry, including buildings. However, a reinforced roof should be able to withstand the impact, allowing an ODST to begin his or her mission with a distinct vertical advantage. SOEIV pods in Ariel's lower atmosphere. Aside from the distinct speed and shock value advantage that the SOEIV has, it also has another advantage over conventional systems. Since an SOEIV is dropped from high orbit, this allows it to enter much tighter spaces like an urban area where a Pelican dropship might have trouble maneuvering. SOEIVs can also be deployed to hazardous terrain, where the long length of a Pelican or another class of dropship would make landing a greater challenge. Along with the quick deployment speed of a SOEIV comes the responsibility of being the first ones in, this means the first wave of Orbital Drop Shock Troopers' primary objective will be securing a landing zone for Pelican and Albatross dropships in order to get a more concentrated force on the ground and to bring in heavier equipment like Warthogs and additional heavy weapons. Upon landing, the hatch of the SOEIV is removed by an explosive gas-bolt system triggered by the occupant. Then, each ODST is responsible for stripping their pod of its store of extra weapons, ammunition, and other supplies, which are then hauled to the unit's temporary encampment. Afterwards, the ODSTs regroup and—as experience demonstrates—whatever the unit accomplishes during the first “golden hour” on the ground will have a disproportionate effect on the outcome of the mission. If a SOEIV is properly functioning after impact, an emergency burst feature can be utilized by its occupant to propel the pod off the ground to a new location. However, the limited amount of fuel in a SOEIV only allows the burst feature to be used for a short duration of time. This variant is made by Ushuaia Armory and weighs 870kg. A scaling of this drop pod. This variant was used by the UNSC Infinity. An improvement on the SOEIV was the Long Range Stealth Orbital Insertion Pod which was in service with the UNSC by 2545. The pods could be launched from slipstream space by a starship. The long range pods were composed of lead foil, titanium, and stealth ablative coating, which allowed them to survive in slipspace. These pod were used to transport SPARTAN-III Beta Company to the surface of Pegasi Delta during Operation TORPEDO. The UNSC partnered with a number of military contractors to introduce an improved version of the venerable design. Aside from some minor aesthetic changes, the post-war pods include more reliable in-flight communications, more powerful maneuvering thrusters and limited inertial compensators, a new brake design, significantly improved structural integrity using new metal matrix composites, and thermal superconducting elements in the heatshield to protect occupants. The internal harness of post-war pods is also highly configurable, and compatible with ODST battledress and MJOLNIR-equipped Spartans. This variant was used by the UNSC Say My Name. A look at this drop pod. This variant was used by the UNSC Spirit of Fire in 2559, alongside the variants seen above to deploy ODSTs and Hellbringers. It bears resemblance to escape pods equipped on the UNSC Forward Unto Dawn, though it is unknown if the two share more than superficial similarities. This style of pod found in use aboard the Forward Unto Dawn as an escape pod. The drop pod on the ODST Blitz card. This style of pod being employed during Operation: SPEARBREAKER. A "Helldrop", deploying Hellbringers as opposed to the typical ODST complement. The United States' Defense Advanced Research Projects Agency (DARPA) is currently working on project SUSTAIN, codenamed "Hot Eagle". The project's aim is to have heavily armed United States Marines launched into suborbital space and then re-enter anywhere on Earth in less than a total of two hours. Specifications have not yet been revealed to the public. The concept of dropping individual soldiers onto a planet from orbit in pods was popularized by Robert A. Heinlein's novel Starship Troopers. SOEIVs in the Halo universe act similarly to those described in the book. The ODST and the book's Mobile Infantry's share the doctrine that officers should be into combat deployed ahead of enlisted personnel. Additionally, the ODST tradition of playing the ODST anthem prior to a drop is similar to Mobile Infantry traditions in Starship Troopers, with the anthem of the unit's respective troop ship played on their radios during mid drop. In Halo Wars, Captain Cutter's special ability allows the player to drop an entire squad of ODSTs in a single pod. While it is possible that UNSC Spirit of Fire uses larger drop pods that can deploy multiple troopers, the requisitioned troopers arrive within about a second and land exactly on target. Indeed, it is possible to land dozens of squads within mere meters of each other over the span of a few seconds; this is merely a gameplay conceit, as realistically representing the logistics of ODST deployment would severely disrupt the flow of gameplay. A scaled drawing of the SOEIV from Halo 2. Concept art of a SOEIV drop bay for Halo 2. Models of the drop pod for Halo 2: Anniversary. Concept art of a SOEIV drop pod for Halo 3: ODST. Concept art of the drop pod for Halo 3: ODST. Exploration concept art of SOEIV variants for Halo 3: ODST. Concept art of a cruiser's drop bay for Halo 3: ODST. SOEIVs being deployed from the UNSC In Amber Clad from Halo 2. SOEIVs are deployed to Installation 05 in Halo 2. A crashed SOEIV on Installation 00. External view of SOEIV launching tubes at the bottom of UNSC Forward Unto Dawn from Halo 3. In-game models of the SOEIV from Halo 3: ODST. The Rookie's SOEIV seen in Halo 3: ODST. View from inside a SOEIV, with various screens and monitors. The UNSC Say My Name's SOEIV drop bay in Halo 3: ODST. The violent re-entry of SOEIV drop pods bound for New Mombasa in the Keep It Clean trailer. Dozens of SOEIVs enter the airspace of New Mombasa just before the EMP blast from the Solemn Penance strikes in the Keep It Clean trailer. Two UNSC frigates deploy their drop pods during the Battle of Ariel. A drop pod of the UNSC Forward Unto Dawn in Halo 4. Drop pods in Halo: Initiation. Concept art for the Drop-pod in Halo 5: Guardians. Concept art of the Halo 5: Guardians drop pod. A drop pod on Array. A drop pod on the "Ascendance" skybox of Parallax. SOEIVs being used to destroy Blisterbacks in Know Your Enemy. An ODST exiting their drop pod. 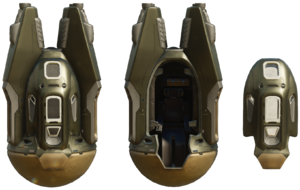 Drop pod in Halo Wars 2 Open Beta. Drop pods being used during the Second Ark Conflict in Halo Wars 2. ↑ 4.00 4.01 4.02 4.03 4.04 4.05 4.06 4.07 4.08 4.09 4.10 4.11 4.12 4.13 4.14 4.15 Bungie.net: Halo 3 ODST : Field Guide - SOEIV "DROP POD"